From left to right: 3 mm (1/8 inch), 6 mm (1/4 inch), 10 mm (3/8 inch), 19 mm (3/4 inch), 30 mm (1-1/4 inch). Suitable for power drill and jaw brace. Ideal for four-jaw braces in conjunction with an adapter. Important: Without adapter to be used only in braces with two- or three-jaw chucks! Shown at left is an old-fashioned brace with two-jaw chuck driving the 19 mm (3/4 inch) hex-shank auger bit. This set-up drilled easily through larch with no undue stress on the chuck jaws. Using too much force (torque) can damage jaws or recesses, or both. It is important to use only as much force as is necessary for the bit to cut into the material. Our drilling trials in larch have demonstrated that this is possible. These bits are very well suited for the small Japanese brace Kuri Kuri. 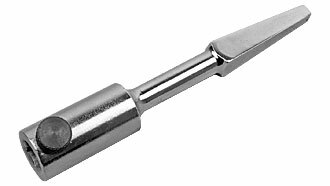 We recommend use of bits no larger than 12 mm (1/2 inch). It is possible to use larger bits, but drilling is slow and rather tedious. 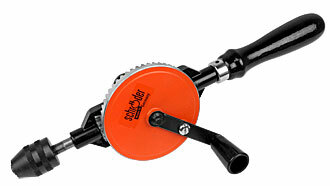 The wheel braces made by Schröder, are also well-suited for use with hex-shank auger bits. Again, we recommend bits no larger than 8 mm (5/16 inch). 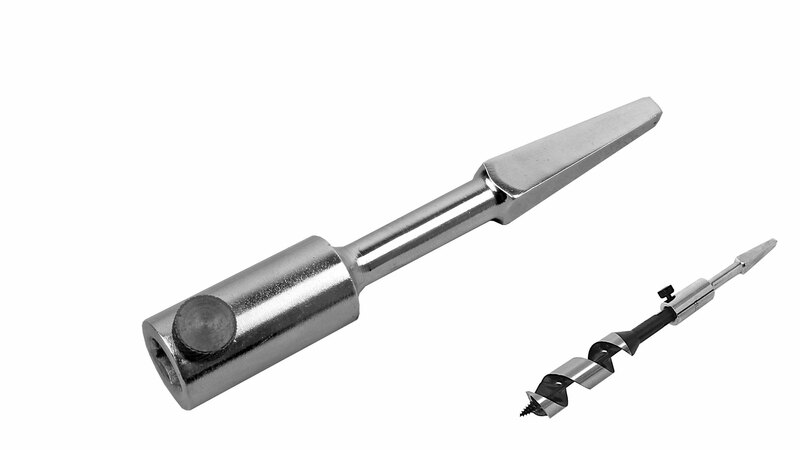 Use of larger bits is possible but makes drilling slow and difficult.